As a special addition, the Vegetarian Society of DC arranged a special menu for its members on Saturday. Local groups such as these help create local communities to discover and share such experiences, and support local entrepreneurs such as Chef Christopher, who are helping to share the Big Picture with a wider range of people! 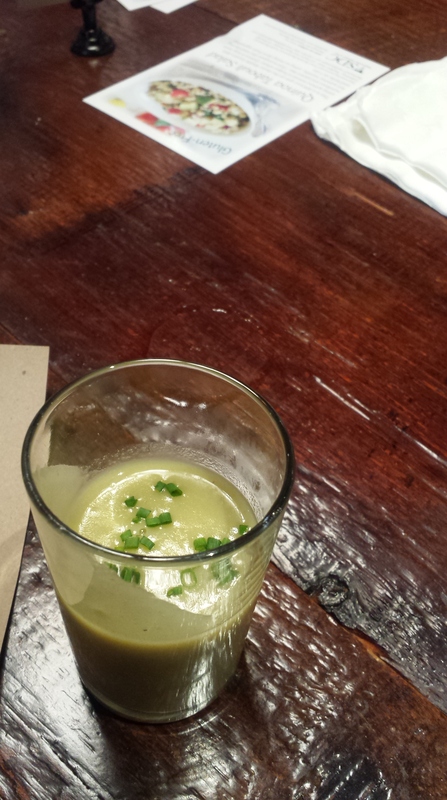 Dinner began with an amuse bouche, a savory and creamy potato and leak soup with chive. Warm ,and thick, this fooled vegetarian and vegan diners into wanting to ask the question: is there milk in that?!? Each sip offered a comfortable, yet layered flavor and a very well blended texture. Hardly the traditional rustic experience of a more traditional Potato and Leak Stew, and surprising to be served both a warm amuse, and a warm soup in sipping service. 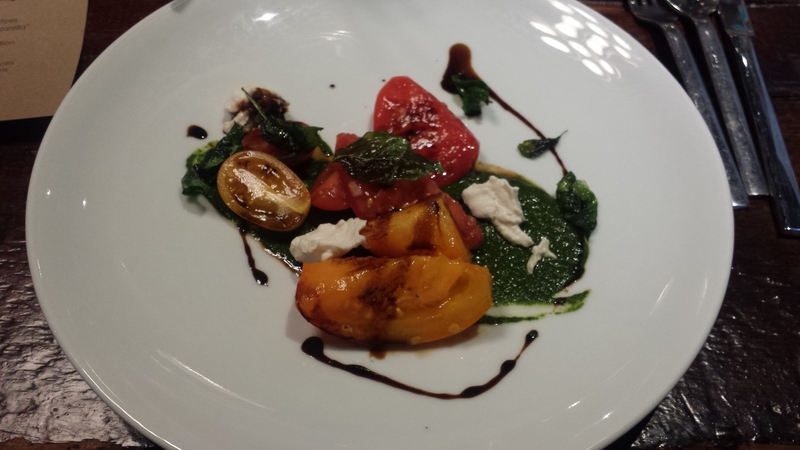 The first course was a bright Heirloom Salad, with fresh and meaty tomatoes, large and cherry, with crisped basil, balsamic reduction painted to present, and a delightful pesto that may have has an asparagus flair. The talk of the table was, as you can well imagine, the ‘mozzarella’, served in frisch, and placed among the vegetables, as unassumingly as a traditional plate. Chef says it is the same presentation that Potter’s House typically offers, with this being the veganised version, offered for this event. The mozzarella had a very light texture, as a fine dairy-frisch, and an un-missably citrus finish, a perfect compliment to the tomatoes and fried basil. The convincing imitation was truly impressive, but I believe the cheese stands on its own, as an impressively white nut-cheese in what Chef Christopher describes as an “ongoing evolution in vegan cheese experimentation”. Those among us with culinary or vegan laboratory interests, Im sure, can relate. The main course was a Porcini Portabello cream sauce over handmade Fettuccini, accompanied by oyster mushrooms and lion’s mane mushrooms. 4 mushrooms, with bold flavors, is not only impressive in such an environment, but really added a complexity to the flavor, earthy and meaty, but also gave the diners an interesting challenge to identify the players on their plate. The fettuccini did not disappoint either, a good bite showed excellent flour consistency, with a good herb balance, in what was a slightly darkened gourmet dough. For handmade pasta, the consistency was perfect, and absorbed the flavor very well. And lastly, the dessert. For many vegetarians and meat-eaters, it is vegan desserts that truly win them over, and in this Core did not disappoint. 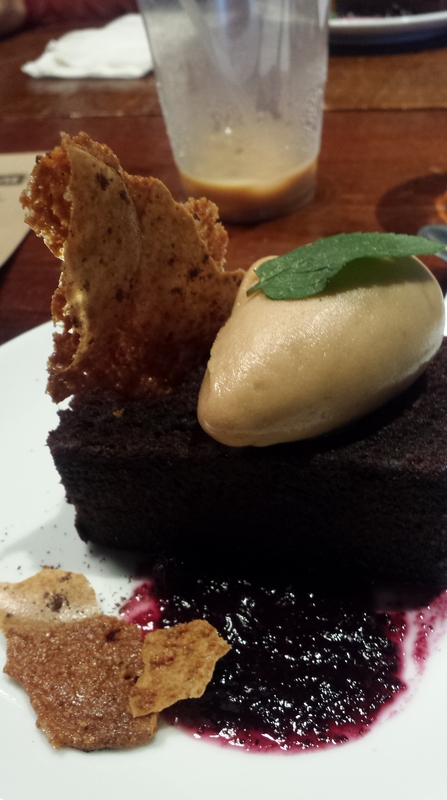 The chocolate cake came in an ample portion, adorned with hazelnut gelato, fresh mint, and espresso macaron. The wafer-like macaron stole the show, a light and airy but resilient texture change to activate the rich cake. Its hard to go wrong with flavor combinations of coffee, hazelnut and chocolate, and all of which were presented on a slightly slap-dash pond of berry compote. The introduction of a fruit into the mix could have been a refreshing alternative to the richness of the other stars, but instead offered a similarly rich, candied, syrup to alternate with the hazelnut gelato– not a detractor but didn’t add much other than another element, which could have been presented in a more visually pleasing manner. Without hesitation, I would say everyone enjoyed the dessert, and the entire meal immensely, and would readily return for more as frequently as they were offered. Core Food offers DC diners such an experience, however as a pop-up, a temporary invasion of other restaurants, to showcase both the culinary chops of the chef, but also to demonstrate the range of delicacy to be found within the vegan palette. You don’t need to give up anything in the taste-department to be a vegan, just the cruelty! Hate that I missed this. Looks delicious.